NDS Flash Carts : iTouch DS, Slot-1 flash linker for Nintendo DS/Lite, Micro SDHC (w/o memory) - SHOP01MEDIA - console accessories and mods, retro, shop - One Stop Shop! Easy to use and very afordable DS linker. Lets you play muiltimedia files, home brew and clean ROMs on your NDS.High quality, easy to use and very afordable DS linker. Lets you play muiltimedia files, home brew and clean ROMs on your NDS. 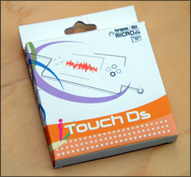 The iTouchDS is a Slot 1 unit for the Nintendo DS and DS Lite. 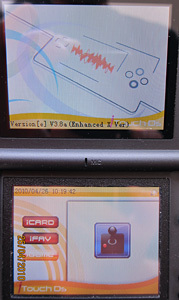 The iTouchDS does not require any additional Passcard or Passme devices to operate. >> Read review at GBATemp. >> Read review at DCEmu. If you are on a limited budget then the iTouchDS is certainly a card to consider. It has a lot of great features and perfect compatibility! Fully compatible with MicroSD and MicroSDHC cards up to 32GB. Simply copy your files onto a low cost, high capacity MicroSD or MicroSDHC card, insert the card into the the iTouchDS and now insert the iTouchDS into your DS or DS Lite and enjoy! You can play MP3’s, read TXT books, and run your homebrew applications with ease. The iTouchds team has made functionality their number one priority with this new generation of DS development. This simply is the best product currently available for the Nintendo DS! iTouchDS features a system which will allow you to create custom shortcuts pointing to any homebrews or games. These shortcuts will appear in the iFav menu from here you will be able to access, run and manage your shortcuts.